What's a good officiant to do? “A good wedding planner is an excellent place to start. Of course the internet and the phone book are filled with the names of ministers and officiants who are want to perform your ceremony, but the best way to know if a person is right for your big day means sitting down with someone to ensure this person reflects the spirit and tone you want created. § Which person can best make our wedding ceremony special and remembered? Will this person write a ceremony specifically and especially for us? § Who do we feel comfortable with in working through the process of creating our own unique ceremony? Is this the kind of person who wants to build a relationship that will lead to trust and comfort on your wedding day? § Who will put the energy and thought into interpreting our desires and elevating our ceremony into something meaningful, not only for us, but for our guests? § Who is personable and enthusiastic about our love? § Will this person be the type of officiant who will care about our joys and sorrows even after the wedding? 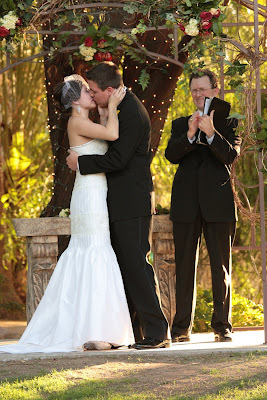 § What training does the officiant have? Is their job as officiant something they take very seriously or something they do as backup when not pursuing another career? § Do you like the sound of his or her voice? Remember, this is the person who will hopefully inspire, instruct, and delight you and your guests at your ceremony! § What are the officiant’s fees? Yes, we realize weddings are expensive, but the words that are spoken at your wedding need to be able to last a lifetime! This is also the time to remember that you paying an officiant for more than the hour to be present at your wedding. Other costs will include working with you to create your ceremony, editing changes to the ceremony as it goes from draft to final version, travel to/from your ceremony site, leading the rehearsal, and as many meetings, phone calls, or emails as you need to feel great about your ceremony. § Although it may seem trivial, what will this person wear? Are they flexible enough to wear a tux, a suit, robes, or tropical shirt or anything else that fits the tone of your ceremony?" For more information about your ceremony, take a look at their website here.